The weather in the UK and especially Edinburgh has been pretty terrible. Yesterday Matt and I popped out for lunch in the sunshine (with no rain forecast) by the time we were walking home it was torrential. In my family we have running jokes about the moment you even think of having a barbecue the rain will come on, it’s similar to when the washing machine goes into its final spin cycle. No matter how blue the sky is, or how distant the clouds are, the weather will turn for the worse. So I am responsible for the terrible weather in Edinburgh this summer. In June I bought a P-O-P-S-I-C-L-E mould. Since then we have barely had a day of sunshine, and the temperature hasn’t raised above 16oC. I had imagined the summer spent with lots of great experiments with these icy treats. Could you get 5 of your 6 a day from a popsicle? Could you successfully recreate a G&T popsicle? Frozen champagne? 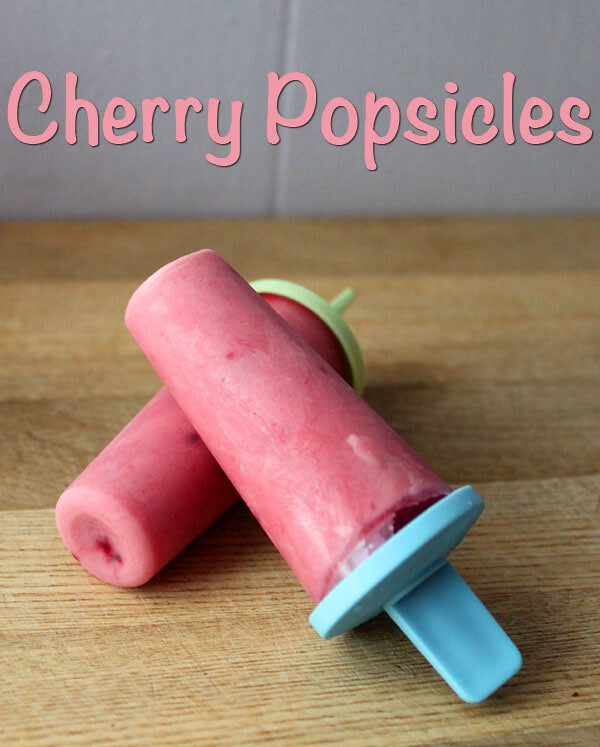 My best laid plans are not to be, however you can’t give up entirely, so I went ahead and made these cherry popsicles anyway.